More in Heaven and Earth: We have Nothing to Learn from these Riots! We have Nothing to Learn from these Riots! And there is a very simple reason for that. Because all the pious, boring observations trotted out by commentators and politicians are all things that we damn well should have known already! Of course mindless, idiotic, destructive, unbelievably selfish and heartless destruction , theft and violence is totally unjustifiable or excusable regardless of other factors. But then we should already know that! Of course there exists an underclass in our society, dangerously detached from the respectable mainstream of our society, ghettoised geographically, educationally under-qualified to compete in a globalised world, and utterly let down by a society that has simultaneously preached mindless consumerism and an open contempt for the traditional moral and spiritual values that kept communities together despite poverty and social neglect. But then we should already know that! The gross failure of the education system when for poorer communities, the lack of stable families and male role models, the sneering contempt at every single common social institution from the liberal 'elite'; the inter-generational worklessness reinforced by pockets of bad education, low skills, crap environments, widespread reliance on welfare, and geographical isolation from jobs and investment. The collapse of an actual sense of community among 'communities' caused by the decline of the social institutions that have traditionally bonded together; the 'progressive' doctrines that tell people that any possible reason excuses them from their own actions and out-and-out expects them to fail; the empty consumerism and nomadic nature of modern economic life, crude multiculturalism & constant immigration, damaging economic disruption and a political culture that just does not listen, does not pay attention and would rather mouth the same platitudes over and over again than face up to the reality that stares them in the face. None of this should come as a surprise to anybody. All of these factors have existed for years and have been clear and obvious for as long for anyone who actually bothers to see. None of them have suddenly become true over the last few weeks. In fact they are largely unrelated. Despite the blase generalisations that have come from so many people, the rioters and looters were not all particularly poor, unemployed, cut off from society, or from broken homes. 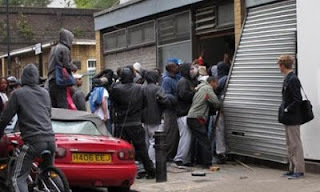 They were not all 16-19 year olds with good prospects cruelly cut short, rioting as a response to the ending of EMA or the increase in tuition fees; nor were not all Black people rioting as a response to police oppression and racism. Many of them had jobs, qualifications, prospects, money, and already owned much of the stuff they then went on to steal. Plenty of people poorer than them didn't steal and riot, plenty of people unemployed didn't murder and rob, plenty of people with fewer qualifications or prospects, or from worse home, kept their dignity and honour and didn't go on a violent rampage. I would like to learn a lesson from a friend of mine and avoid falling into hyperbole. So I'll say that, for me, the 2nd worst thing about these Riots is that for a few days, or weeks if we're lucky, these issues will be aired. Various commentators and politicians will pull them out and dust them off and trumpet them in connection with the disturbances we've suffered, regardless of whether there's any actual real or direct connection involved. Everyone will have an opinion about their favourite left wing or right wing explanation, almost all based on nothing more than personal hunches and a complete absence of actual data. But then after a few weeks the media focus will move on. The politicians and commentators will pontificate about some other subject that has been pushed into the news and this will all once again sink back below the surface of our national conversation, to fester and spoil, invisible in plain view, while our leaders and commentators mouth the ideological platitudes that are so much easier and more satisfying than facing up to the difficult reality of issues that no one on the political divide has any easy solution to. Hopefully this time will be different. Hopefully the politicians and media will not just move on but will take a concerted and realistic look at the problems that dog many of our communities. Maybe they'll actually be motivated to try something different rather than mouth the same irrelevant platitudes that press the right ideological buttons but have so little do with what is actually going on in people's lives. To be honest I'm not that hopeful, but it would be wrong to be entirely cynical and despondent. It is precisely that gnawing cynicism that gets us into this situation and then leaves us stuck there. Because the truth is we can change even these seemingly intractable problems for the better. It all comes down to the choices people make, both in the short term and the long term. Whether they take the hard choices and face up to the uncomfortable reality we have to deal with as individuals and a society, or the easy choices, either for themselves or us all, and try to sweep it all under the carpet once again and hope it will magically just go away. Only time will tell. But we can all do our part, if we just have the will and determination to take some responsibility for the world we live in, both individually and socially. Dear Father, we pray . . .